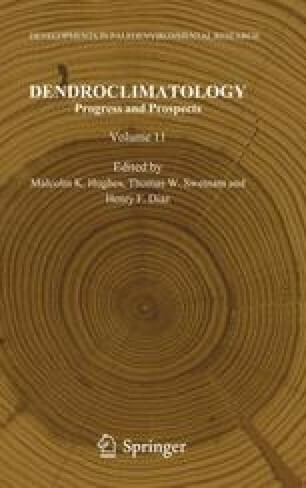 Some fundamental concepts of dendrochronological analysis are reviewed in the context of statistically modeling the climatically related environmental signals in cross-dated tree-ring series. Significant uncertainty exists due to our incomplete mechanistic understanding of radial growth of most tree species in the natural world, one where environmental effects are unobserved, uncontrolled, and steadily changing over time. This biological uncertainty cascades into the realm of statistical uncertainty in ways that are difficult to quantify even though the latter may be well constrained by theory. Therefore, great care must be taken to apply the many well-developed and tested statistical methods of dendrochronology in ways that reduce the probability of making false inferences. This is especially true in the case of biological emergence. This is a special case of uncertainty that arises from the way in which trees as complex organisms can have properties expressed in their ring widths that are impossible to predict from a basic understanding of lower-level physiological processes. Statistical modeling must be conducted in ways that allow for the discovery of such phenomena and, at the same time, protect from the incorrect acceptance of spurious emergent properties. To reduce the probability of the latter, we argue that model verification be an important part of any dendrochronological inquiry based on statistics. Correlation and response function analysis is used to illustrate some of the concepts discussed here. The value of empirical signal strength statistics as predictors of climatic signal strength in tree rings is also investigated. This chapter is a contribution to the meeting ‘Tree Rings and Climate: Sharpening the Focus,’ held at the University of Arizona, Tucson, on April 6–9, 2004. We thank the organizing committee members (Malcolm Hughes, Henry Diaz, and Tom Swetnam) for their kind support and encouragement. This chapter is based the generous long-term support of the Lamont-Doherty Tree-Ring Laboratory (TRL)by the National Science Foundation and the National Oceanic and Atmospheric Administration Office of Global Programs. The U.S. Department of Energy Global Change Education Program also supported N. Pederson in his PhD dissertation research at the Lamont TRL that contributed to this chapter. We also thank the Mohonk Preserve (Paul Huth and John Thompson) for permission to sample trees used in this study and for access to the Mohonk Lake meteorological data, and to the remarkable naturalist Daniel Smiley of Mohonk who made all of this possible. Lamont-Doherty Earth Observatory Contribution No. 7205.
where r xy is the correlation between cores x and y. The effective RBAR (REFF) is a weighted average of RBT and RWT that includes the added signal strength due to the within-tree correlations.